The sweet scent of magic saturates the atmosphere of this rustic paradise called Sonya’s Garden. Stepping into a journey of wellness, the place relaxes the eyes, calms the body, refreshes the soul. The owner, Sonya Garcia, taught me something very valuable here, the art of doing nothing. Let Sonya’s Garden do all the thinking and pampering, and take that much needed break. Pick your flowers and eat them too! When the place isn’t so packed with guests, take time to ask for a garden tour. It’s an amazing experience to pick flowers for you to taste. Some were spicy like wasabi, some were sour. Trying something new always reinvigorates my spirit, bringing out the child in me. The garden tour doesn’t end with edible flowers, they also have so many gardens to visit. There’s a fragrance garden where the sweet scent of lavender embraces the air. 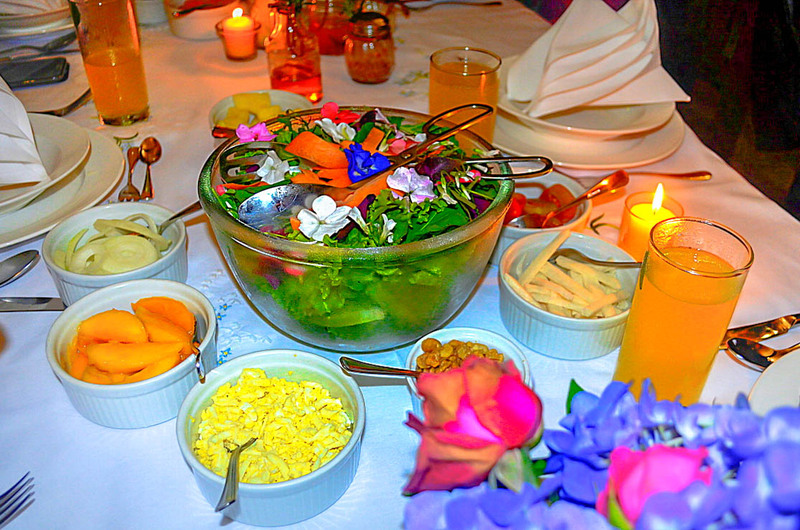 The flowers in the garden are also in the salad which is included in their lunch and dinner buffet, plus pasta, salmon belly, breads and dips, and dessert. You can create your own salad. They have lettuce, arugula, mango, broad beans, eggs, cucumber, jackfruit, edible flowers, pineapple, white corn, and fruits in season. Drizzle this with Sonya’s Secret Salad Dressing, balsamic vinegar or EVOO (extra virgin olive oil). The salad comes with freshly baked whole wheat sesame bread from Sonya’s panaderia. Choose from their dips and toppings: basil pesto, white cheese, anchovies, bruschetta tomato toppings, mushroom pate, black olive tapenade, and fresh green peppercorn in olive oil. Their pasta has two kinds of sauces: sun dried tomato and chicken cream with mango. Top this with ratatouille, shiitake mushrooms, black olives, capers and grated parmesan cheese. They also serve unlimited salmon belly. For dessert, they have glazed sweet potato to be eaten with mint leaves, banana rolls with sesame and jackfruit, and chocolate cake. Wash it all down with the bottomless freshly-squeezed dalandan juice and tarragon tea. For the breakfast buffet, they serve daing na bangus with mango salsa, eggs (served the way you like), chicken and pork adobo, bread with assorted marmalade, garlic rice, fruits in season, and brewed coffee, tea or hot chocolate. My friends and I spent the night here. The cottage liberated us from the distractions of busyness. No TV, no radio, no computer. Just us friends rediscovering the joys of actual face to face conversations. It was sooooo relaxing. The beds, the walls, the bathrooms, the curtains, the interiors, these made us feel so special. Country living made exquisite. The large bay windows allowed the cool breeze to carry the scent of trees to fill our room. You can hear the insects chirping, but don’t worry, they have screens to keep them from entering. There are no air conditioners but the place is situated in Alfonso, Cavite (near Tagaytay) which has a cooler climate compared to Manila. But if you feel you need the extra cooling, you may request for electric fans. Every stay comes with a complimentary early DINNER or LUNCH, with full BREAKFAST. Here you can find treats not available anywhere else. 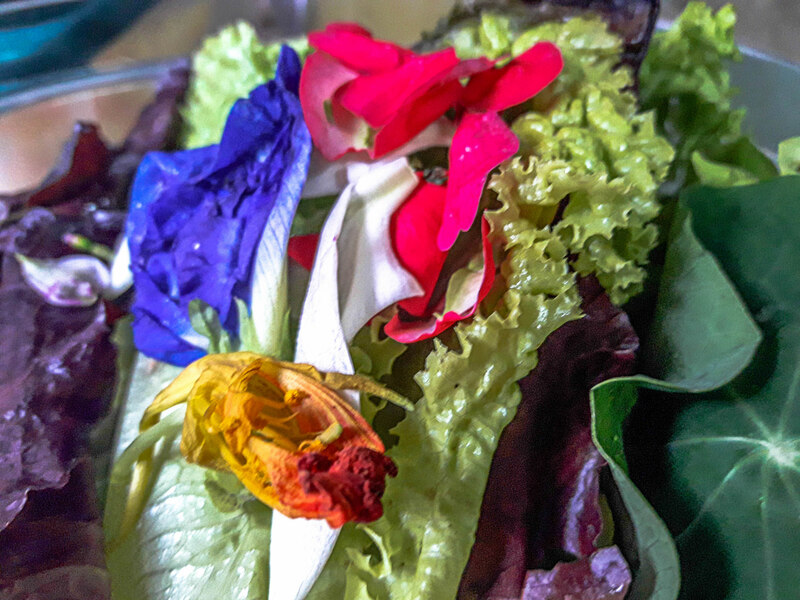 They have the organic fresh salad pack that includes edible flowers. They also have cheese hopia and leek hopia. And so many other goodies. Aside from the Panaderia, Sonya’s Garden also has other shops, click here for details http://sonyasgarden.com/shops/. Sonya’s Garden Spa is a healing place to make you feel brand new. Sonya’s signature massage is a must, making use of Sonya’s favorite strokes with lavender-scented oil. After the treatment, enjoy their warm basil dalandan tea. The Secret Haven is a few minutes away from Sonya’s Garden and is owned by Sonya. It’s a hidden spot where you can enjoy the natural mineral spring-fed cool chlorine-free river. Bring extra changing clothes and towels. When the sun sets, Sonya’s Garden transforms into an enchanting place full of colorful lights enhancing the beautiful landscape. It’s truly a visual delight. Wedding? Anniversary? Birthday? Christmas party? If you’re thinking of having an out of town celebration with 40 up to 400 guests, Sonya’s Garden has different function halls and services that are very affordable compared to other venues around the Tagaytay vicinity.